Atlantic Clipper is an urban legend up and down The East Coast of Australia - but just why is it the most popular backpacker boat in The Whitsundays? Is it the spa and waterslide? Maybe. Is it the dashing crew? Perhaps! Find out for yourself on this two day/two night sailing trip – ask us on LiveChat right now for our super special rate! This monster vessel is a whopping 140ft and carries up to 53 guests per trip over three levels. It actually has the most space per person per square metre than any other boat in our region, with cabins sleeping a maximum of four people per room. Each room and the saloon is also air conditioned, so there is no sweltering for anyone on the lower levels! 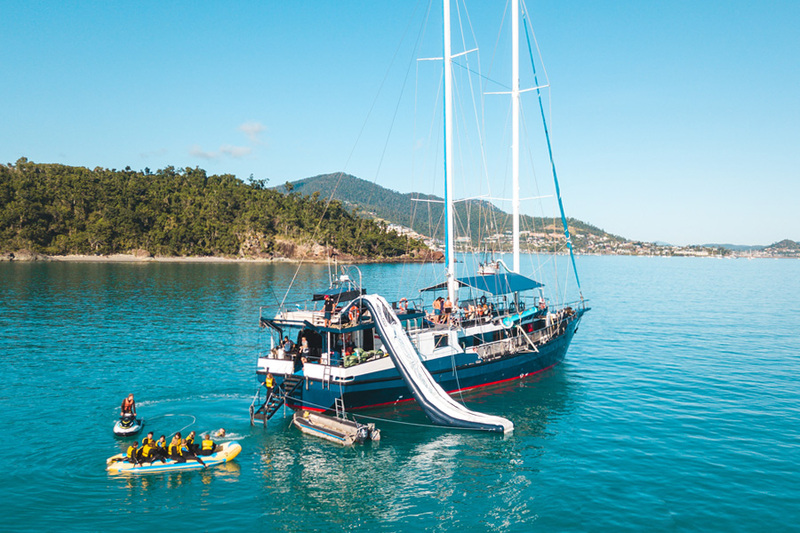 Clipper also features eight hot and cold showers, six separate toilets, an eight metre water slide, and a spa which fits up to twelve people - so there is plenty of room for everyone on board! Clipper departs Tuesday, Thursday and Saturday at 1:00pm (varying slightly depending on tides) and returning at 11:30am (also may vary) on Thursdays, Saturdays and Mondays. Please this is a sample of menu and is subject to change and amendments. Dietary requirements can be accommodated if we are notified at the time of booking. Are you bold and brave enough for Atlantic Clipper? This boat fills weeks in advance, so contact us on 1800 550 751 to check availability and get the latest rates! Please only bring a small soft overnight bag without any zippers (ie. a re-usable shopping). A zipless souvenir bag can be purchased at the boat's check-in office for a few dollars. Ensure you pack clothes, a hat, swim-wear, towel, sunscreen 30+, warm pullover for the evenings (seasonal) and cash/card for on board purchases. Feel free to bring on board a reusable water bottle and/or additional snacks. You will also need to bring your own alcoholic beverages, available for purchase in town. No glass bottles please. Excess luggage can be stored at several places in town including most boat check-in offices, most hostels, or at your accommodation. Most charge between $5-10pp for the duration of your trip. *Please note Atlantic Clipper departs between 11:45pm & 2:15pm depending on the tide. BYO alcohol (no glass) and scuba diving. Soft drinks available for purchase on board. Atlantic Clipper offers onboard scuba diving for both certified divers and those without experience/qualification. Scuba dives MUST be pre-booked, but are paid for on board. Scuba dive is $65pp - MUST be pre-booked. Jet boat rides and banana boat rides can also be purchased. These optional extras can be decided on and paid for on board. Your safety in the water is our primary concern. To ensure your comfort and safety divers must be 18 years or over and they will require that you have a Divers Medical Certificate for certain medical conditions. *A $40 per person Public Holiday Surcharge is applicable to tours where the vessel is at sea on Christmas Day or New Years Day. All cancellations will incur a 25% cancellation fee. Cancellations made within 60-30 days of travel will result in a 50% cancellation fee. Cancellations made within 30 days of travel will result in a 100% cancellation fee. A $40 per person transfer fee applies to ALL name or date changes. If the sailing company has to cancel the trip (prior to the boat's departure) and we cannot offer a suitable alternative, then a refund will be given minus card fees. We strongly recommend that you have travel insurance, especially during the wet season if you are delayed or cannot travel.